Eminence Wildflower Ultralight Oil is a multipurpose ultra-lightweight oil for the body, hair and nails. Enriched with Evening Primrose Oil and Primula Oil, it soothes and restores dry skin, leaving skin looking calm. Easily absorbed into skin, it provides sheer moisture to revitalize the skin�s appearance. 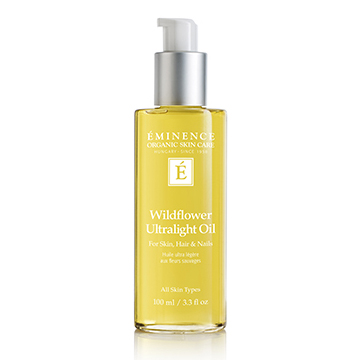 Eminence Wildflower Ultralight Oil nourishes and hydrates skin, hair and nails while leaving a smooth satin finish. A natural and organic dry oil for body. Soothes and reduces the appearance of redness. Provides sheer moisture to revitalize the skin�s appearance. Protects skin from environmental stressors causing dryness. Ideal for use after bathing.